Note: When you have an account the website remembers your uploaded images. CLICK HERE to log in if you don't see your images from your last visit or create a new account. For best results your image should be 300 pixels per inch at desired image size. Example a 10"x10" print should be 3000 px x 3000 px. If you need to enlarge your image to fit the size you want we recommend up-scaling up to 4x the original size for FREE at Let's Enhance and then uploading the new file created for printing. Keep in mind, the larger the file, the larger the print. If you are starting with a physical photograph or piece of art, scan at 300ppi resolution at the desired size for best results. Resolution quality from most digital cameras can vary. For best results, use a camera that is at least 3 megapixels and take your photo at the highest setting. We accept JPG and TIFF format please convert any other format to this format. For more information on cameras megapixels please go to our "Megapixels Explained" section. Digital art and photography does not generally need proofing. 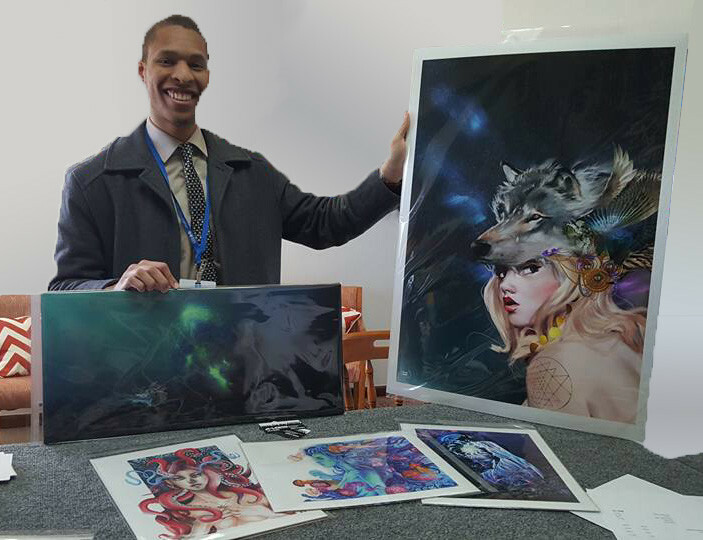 With other artwork, recommend the proofing process because it provides you, the artist, confidence with the process and we can guarantee the color quality. We can do that for you at a reasonable cost more details at Digitize Your Art. Are you are too far away to bring in the original? Two options are available, photograph or scan your work. If you don't have a scanner, take it to your local copy store, for smaller images or seek out a local image drum scanner service for larger detailed work and have it scanned. We recommend photographing your work because it is much more accessible for works larger than 8.5”x14”.